Will Smith and Jada Pinkett Smith's Malibu home lays out on 25000 square feet and maintains a very peaceful, Moroccan/Persian/Spanish/Southwest America type of style which incorporates nature and artistic details that make a difference. Architectural Digest shows off an amazing mansion that is very 'spiritual' and that is a perfect match for Jada and Will. 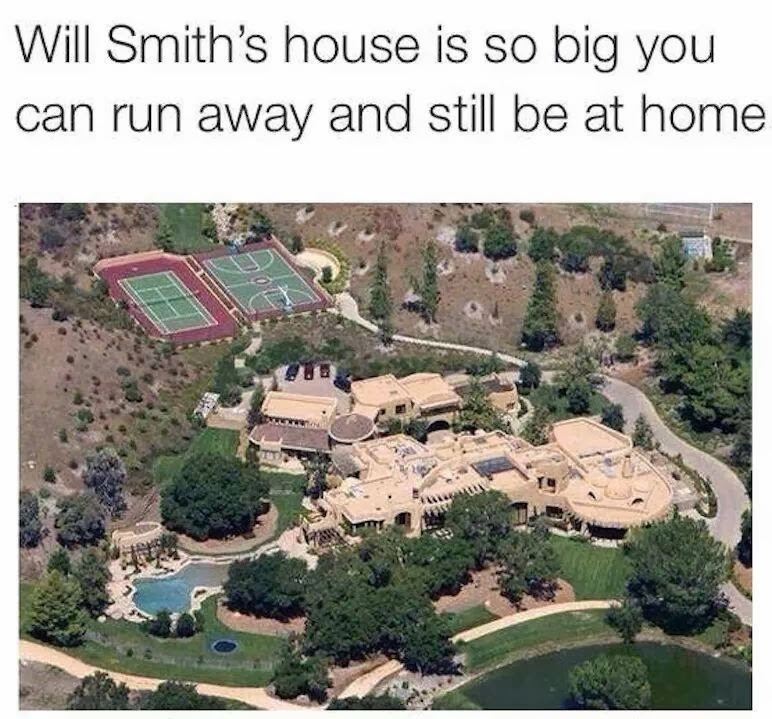 Hey everybody, Will Smith has a huge house! What? You’re not surprised? We weren’t either, but we were a bit taken aback by the level of craftsmanship and detail that was put into the creation of the 25,000 square foot Malibu home. Designed by Stephen Samuelson;the home, recently featured in Architectural Digest, was built with no dead-ends in order to, as Will himself put it, “create an infinite cycle that represented what Jada and I had hoped for our love”. They also had the entire place built by hand; bringing in stone-masons, steel workers, and every other form of craftsmen you could imagine to create a home unlike any other in the world. Can you imagine some tunnels and secret MIB-type bunkers underneath that monster? If the home itself doesn’t catch your fancy, you can go elsewhere on the estate’s property and use the private basketball court, private tennis court, huge pool, or the multi-car garage. As with most celebrity homes, the place is a bit much and probably more than the residents will ever need, but kudos to Will for having such a unique place built. will Smith, Jada Pinkett Smith, and their multi-talented family display their never-before-photographed Southern California home (located near Calabasas, Calif.), in the September issue of Architectural Digest magazine. The cover features the movie-star couple, while one photo in the magazine gathers together, for the first time, the entire family, including Trey, Smith's son from his first marriage, 18; Jaden, 13; and Willow, 10. Included in the story are pictures of Smith's recording studio (where Willow recorded her single "Whip My Hair"); two kids' rooms, one with bunk beds, the other a canopy bed; and a great room with views out to the mountains. The entire house is decorated in neutral hues with eye-catching pieces like purple shag pillows and exotic tribal-printed chairs. Interior designer Judith Lanceadds that everything in the house "had to look handcrafted but at the same time refined and sophisticated."